The natural range of Ovis canadensis was formerly in the Rocky Mountains from southern Canada to Colorado, but is now reduced to small bands protected by inaccessible habitat or by refuges. The desert subspecies (Ovis canadensis nelsoni) ranges from Nevada and California to west Texas and south into Mexico. Another rare member inhabits the Sierra Nevada Mountain of California. The Bighorn's body is compact and muscular; the muzzle, narrow and pointed; the ears, short and pointed; the tail, very short. The fur is deerlike and usually a shade of brown with whitish rump patches . The fur is smooth and composed of an outer coat of brittle guard hairs and short, gray, crimped fleece underfur. The summer coat is a rich, glossy brown but it becomes quite faded by late winter. The male sheep is called a ram and can be recognized by his massive brown horns. The horns curl back over the ears, downs and up past the cheeks. By the time a ram reaches 7 or 8 years of age, he can have a set of horns with a full curl and a spread of up to 33 inches. Ewes, the females, are smaller than the rams and have shorter, smaller horns that never exceed half a curl. The desert subspecies, Ovis canadensis nelsoni, is somewhat smaller and has flatter, wider-spreading horns. Typical diet: mainly grasses, sedges and forbs. During the rut, the Bighorn rams will snort loudly. The lambs bleat, and the ewes respond with a guttural "ba." They also utter throaty rumbles or "blow" in fright. Bighorn have extremely acute eyesight, which aids in jumping and gaining narrow mountain footholds. They often watch other animals moving at distances of up to a mile away. The Bighorn's tail is very short. The ears are short and pointed. The Bighorn's muzzle is narrow and pointed. The cloven hooves are sharp-edged, elastic, and concave. Double-lobed, 3-3.5 inches long with foreprints slightly larger than hindprints — somewhat similar to deer prints but less splayed. Bighorn sheep are gregarious, sometimes forming herds of over 100 individuals, but small groups of 8-10 are more common. Mature males usually stay apart from females and young for most of the year in separate bachelor herds. They usually migrate seasonally , using larger upland areas in the summer and concentrating in sheltered valleys during the winter. Males do not defend territories but rather engage in battles over mating access to a particular female. Age as well as horn determines male dominance status. Although not as well built for climbing as mountain goats, Bighorn Sheep zigzag up and down cliff faces with amazing ease. They use ledges only 2 inches wide for footholds, and bounce from ledge to ledge over spans as wide as 20 feet. They can move over level ground at 30 miles per hour and scramble up mountain slopes at 15 m.p.h. They also swim freely, despite their massive bulk and the weight of their horns. Desert Bighorns utilize two mechanisms for cooling — perspiring, and also panting, which is a fairly uncommon adaptation for desert animals. When the summer rains finally arrive, they resume the more common behavior of their species. Bighorn inhabits alpine meadows, grassy mountain slopes and foothill country near rugged, rocky cliffs and bluffs, allowing for quick escape . In winter, Bighorn prefer slopes 2,500-5,000 feet where annual snowfall is less than 60 inches a year, because they cannot paw through deep snow to feed. Their summer range is between 6,000-8,500 feet in elevation. Bighorns are primarily grazers, consuming grasses, sedges, and forbs, but it will take some browse when preferred food is scarce (especially in winter). Desert bighorns (O. c. nelsoni) eat a variety of desert plants and get most of their moisture from the vegetation, although they still visit water holes every several days in summer. When summer temperatures become extreme and water sources dry up completely, Desert Bighorns rest most of the daylight hours and feed at night. During this season, they rely on certain desert plants for both food and moisture. They use their hooves and horns to remove spines from cacti, then eat the juicy insides. They are fond of the tender shoots of Prickly Pear and Cholla, and the flowers of succulents like Agave and Squawgrass. Known for the head-to-head combat between males. Combat between rams has been observed to last longer than 24 hours. Horn size is a symbol of rank.Male horns can weigh as much as 30 lbs. Desert Bighorn do not require drinking water in winter when green vegetation is available. During the summer months they visit waterholes at least every 3 days. Bighorns have a complex 9-stage digestive process that allows them to maximize removal of nutrients from food of marginal quality. Rutting season is in the autumn and early winter, and births take place in the spring. Mating for the desert bighorn, however, can last from July to December. Gestation lasts from 150-180 days. One or two lambs are born near steep cliffs from late February to May. Within a few weeks of birth, lambs form bands of their own, seeking out their mothers only to suckle occasionally. They are completely weaned by 4-6 months of age. In the deserts, only about one-third will survive their first summer. In the desert, a lamb born late in the season stands little chance of survival, since temperatures reach over 100 degrees F in May and often reach 120 F by June. Recent studies of high lamb death rates focus on viruses possibly introduced by domestic livestock, to which the native Bighorn have little or no immunity. Female Bighorn usually do not breed until their second or third year in the wild. Due to competition, males do not usually mate until they are 7 years old. Most sheep live over 10 years, with a maximum of 20 years. Ewes are protective of their young for many months. Yearlings, often abandoned while the ewe is giving birth to her next lamb, may be seen again with the ewe and lamb late in the spring. Bighorn find safety in numbers and are ever watchful for predators such as Coyotes and Mountain Lions. Threatened with eventual extinction, Bighorn numbers are only one-tenth the population that existed when Europeans first began exploiting the Rockies. The subspecies Ovis canadensis auduboni of the Black Hills and adjacent areas has already become extinct. Hunting has been prohibited or controlled since the early 1900s, but much illegal poaching still occurs. 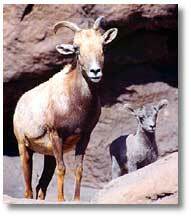 In March, 1998, the Peninsular Bighorn Sheep was listed as endangered by the U.S. Fish and Wildlife Service. Today, Bighorn still range into Baja California, but their numbers have dwindled to less than three percent of the estimated 1.5 million of the early 1800s. 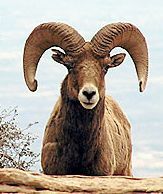 Estimated in 1979 to number 1,180 Bighorn between Mt. San Jacinto and the Mexican border, the estimate in 1996 had plummeted to 280 sheep. Recent genetic evidence indicates the Sierra Nevada Bighorn is a unique form of Bighorn found only in the Sierra Nevada. Sierra Nevada bighorn are rarer than the Florida Panther, and rarer than the California Condor. They are clearly one of the most endangered mammals of North America. In 1986 these sheep were reintroduced to the Mono Basin from a population further to the south. Now the population in Lee Vining Canyon is the primary hope for the future of Sierra Nevada Bighorn. Human activities are responsible for the Bighorn's decline. Grazing, mining, depletion of water holes, homesteading and use as camp meat spelled disaster for the Bighorn. In the desert, off-road vehicles, trespassing cattle, poaching in the 1960s and early '70s, drought, disease and Mountain Lion predation have worked together to push this population to the edge of extinction.